There are 50 pcs sanding bands sleeves, with 2 mandrels. 6mm(0.24"). 50 x Drum Sanding Bands. 3.15mm(0.12"). Shank Length: Approx. 38mm(1.5"). Special electric grinding polishing sand ring, often used for wood,polishing. Specification: - Material: Sandpaper. - Suitable for manicure as well as pedicure. - Great for use nail drills and other drills using sanding bands. 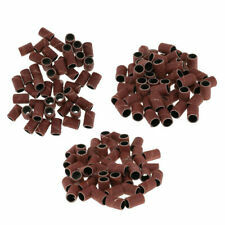 50 Pieces x 80# Nail Drill Sanding Bands. 50 Pieces x 120# Nail Drill Sanding Bands. Suitable for manicure as well as pedicure. - Great for use nail drills and other drills using sanding bands. 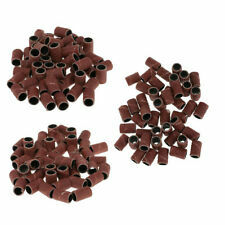 50 Pieces x 80# Nail Drill Sanding Bands. 50 Pieces x 120# Nail Drill Sanding Bands. 50 Pieces x 180# Nail Drill Sanding Bands. Suitable for manicure as well as pedicure. Specification: - Material: Sandpaper. - Great for use nail drills and other drills using sanding bands. 50 Pieces x Nail Drill Sanding Band. - Type: 120# (Midium Grit). 12pcs high quality nail drill bit grinding head set in different head shape. Can grind the nails into your desired shape also polish the top of acrylic nails to make them smooth. 12Pcs/set Nail Grinding Head. Suitable for manicure as well as pedicure. - Great for use nail drills and other drills using sanding bands. 50 Pieces x Nail Drill Sanding Band. - Type: 180# (Fine Grit). - Can be used for natural nails as well as artificial nails. Suitable for manicure as well as pedicure. - Type: 180# (Fine Grit). - Great for use nail drills and other drills using sanding bands. 50 Pieces x Nail Drill Sanding Band. - Can be used for natural nails as well as artificial nails. Suitable for manicure as well as pedicure. - Great for use nail drills and other drills using sanding bands. 50 Pieces x Nail Drill Sanding Band. - Type: 120# (Midium Grit). - Can be used for natural nails as well as artificial nails. 100x Sanding Bands. - Nail salon essential goods, high quality, study, duable and not easy fall off. - Size: Approx. Suitable for manicure as well as pedicure. 50 Pieces x Nail Drill Sanding Band. - Great for use nail drills and other drills using sanding bands. - Type: 80# (Coarse Grit). Suitable for manicure as well as pedicure. - Great for use nail drills and other drills using sanding bands. 50 Pieces x Nail Drill Sanding Band 80#. 50 Pieces x Nail Drill Sanding Band 120#. - Type: 80# 120#. Suitable for manicure as well as pedicure. 50 Pieces x Nail Drill Sanding Band. - Great for use nail drills and other drills using sanding bands. - Type: 120# (Midium Grit). Suitable for manicure as well as pedicure. - Great for use nail drills and other drills using sanding bands. 50 Pieces x Nail Drill Sanding Band. - Type: 80# (Coarse Grit). The product is new and in good conditon, just go ahead and buy! Suitable for manicure as well as pedicure. - Material: Sandpaper. 50 Pieces x Nail Drill Sanding Band 120#. 50 Pieces x Nail Drill Sanding Band 80#. - Great for use nail drills and other drills using sanding bands. Suitable for manicure as well as pedicure. 50 Pieces x Nail Drill Sanding Band. - Great for use nail drills and other drills using sanding bands. Suitable for manicure as well as pedicure. - Material: Sandpaper. - Great for use nail drills and other drills using sanding bands. 50 Pieces x Nail Drill Sanding Band 80#. 50 Pieces x Nail Drill Sanding Band 120#. Material: Sandpaper. Great for use in Electric Nail Drills and other drills using sanding bands. Sanding Bands. Colour: Deep Brown. Type: 180#. Features: 100% brand new and high quality. Use: commonly used in grinding Bodhi peeled, wood carving, grinding nuclear carving. Also plastic polish, metal polish rust, jade, DIY circuit board production. Silicon carbide has corrosion resistance, high temperature, high strength. Good thermal conductivity. Specifications: Material: Silicon carbide abrasive Gauze base. Size: High:12m(0.47inch); big circle inner diameter: 12.7mm(0.5inch); small circle inside diameter: 6.35mm(0.25inch). . Suitable for manicure as well as pedicure. Specification: - Material: Sandpaper. - Great for use nail drills and other drills using sanding bands. 50 Pieces x Nail Drill Sanding Band. - Type: 180# (Fine Grit). Suitable for manicure as well as pedicure. - Great for use nail drills and other drills using sanding bands. 50 Pieces x Nail Drill Sanding Band. - Type: 80# (Coarse Grit). A 3-year warranty is promised, your satisfying is our ultimate pursue.